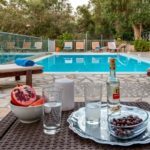 In a green and gorgeous hillside setting, just 300m from the nearest taverna and a short drive or twenty-five-minute walk from the charming village of Loggos, Villa Milou looks over the treetops to the bay below. A fine choice for a family holiday, the villa is generously proportioned and thoughtfully equipped, indoors and out, encouraging open-air living with a built-in barbecue, shaded terraces furnished for dining and relaxing, and cushioned teak loungers beside the infinity pool. 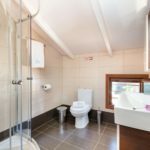 Within the air-conditioned villa, the layout is planned to create convivial social space and to make the most of the views; so, on the lower level, the attractive kitchen / diner opens out to the terrace, as does the airy master bedroom, joined by a simply styled twin room. 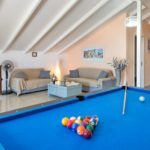 The third bedroom shares the upper floor with a very spacious family room, with sofas and a 40” plasma TV, a kitchenette area, a billiard table, and double doors to the upper sea view terrace. 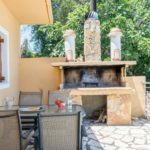 The innately relaxing Villa Milou is a 300metre stroll from a good local taverna. 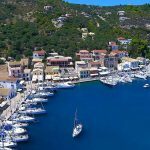 Kipos beach is 1.8km away, and Gaios is just 6km to the south, with its waterside restaurants, Venetian buildings and ever-changing flotilla of visiting yachts. 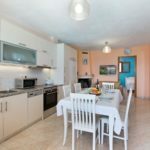 Fully equipped kitchen with dining area opening into the veranda, small sitting area with satellite TV, 1 double bedroom with patio doors opening onto the veranda with swimming pool & sea views, 1 twin bedroom and 2 bathrooms with shower. 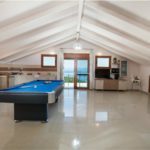 Open space living area with satellite TV & billiard table large area, patio doors opening onto the balcony with sea view, kitchenette with hubs & sink, 1 twin bedroom and bathroom. 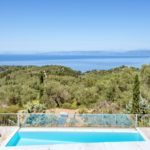 Large infinity pool with sea views 5m x 8m and 0,80 m x 1,90m, large covered sitting area by the pool, built in BBQ with dining area & another dining al-fresco covered area with views to the sea and to the pool & private parking. 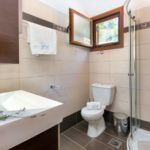 Surrounded by its own colourful garden of lush green trees and shrubs, Villa Emmy is set on a slope by the sea at just 30 meters from the water edge. 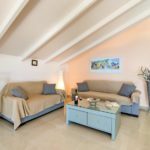 Its swimming pool and sunbathing terrace are just below the villa, and rock bathing in the briny just below the grounds is at a two mins walk away. 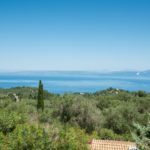 There are pretty views across the water from the poolside, and if you wish to relax on a beach, Plakes Beach and Yana Beach are at a 5 minutes walk from the villa. 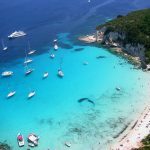 The village of Gaios, the capital of Paxos, with day and night life is reached by a 10 minutes relaxing stroll along the sea shore road. 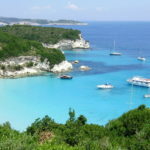 A fine family villa in Paxos, the effortlessly elegant Siorra Elena gazes out to sea from its green and gorgeous hillside setting, close to a choice of beaches and to the island’s capital town. 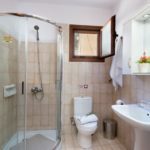 Rest and relaxation come as standard in this rural idyll, where Siorra Elena is surrounded by cypress and olive groves and overlooks the bay of Gaios. A perfect venue for big family gatherings, the villa is spacious inside and out, with a series of furnished balconies and terraces for al fresco meals or poolside sun-soaking, and accommodation which is generously proportioned and thoughtfully equipped.T he unusual layout is excellent for two families holidaying together, as each floor has its own kitchen, sitting room and outdoor dining area, preserving privacy while allowing for together-time. All the rooms are stylishly furnished in soft summer colours, blending contemporary comfort with timeless elegance, and cushioned teak sun beds make the most of the views from the swimming pool terrace. 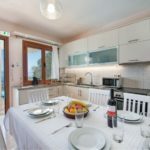 Local attractions are easily accessible, with Kamini and Kloni Gouli beaches within a ten-minute stroll, and the character, shops, restaurants and harbour of Gaios a couple of kilometres away.